Last night, I had a dream that my future wife(?) and I were going to a Murugan temple. I'm not sure where we were but my wife saw a rainbow in the sky and immediately said to me,"[my name], look a rainbow." She then closed her eyes and repeated Sri Skanda's sacred mantra 3 times. I saw the rainbow, too, but I couldn't close my eyes like my wife to say Sri Skanda's sacred mantra since I was driving, so I said it along with my wife. 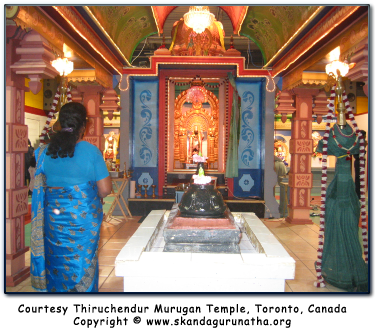 When we reached the temple, there was a small black Murugan vigraham in the centre of the temple, similar to murthi in the Thiruchendur Murugan Temple. My wife was wearing a blue traditional saree and I was wearing a veshti and a white shirt. The temple was empty with no devotees in it yet the dheepam (lamps) were lit and the curtain to the mulasthaanam was left open. Aum...Jaya Jaya...Mahavira Bhagavan...Sri Skanda....Namo Namaha! I repeated this mantra with my wife, however, she was absolutely still and continued to close her eyes and repeat the mantra over and over again. As I continued to repeat the mantra with her, Murugan kept walking forward and came out from the mulasthaanam. His form was fluid and alive like that of a shadow, yet it was the stone vigraham that moved. In His right hand was His beloved Vel and it shone with a golden white light that almost blinded me. I felt the wonderous golden light gently touch my face and that of my wife's also. As He continued to walk out of the main altar, He walked straight in the centre and then took a detour towards my wife as she continued to repeat His mantra. It was then when I awoke. I think this experience is a wonderful way of Lord Murugan to showing us how He blesses us as a couple. Moreover, I thank Him for showing us how to properly pronounce this sacred mantra and for giving us mantra diksha! I also think He is also showing us that as we continue to remember Him, by chanting His sacred and powerful mantra, He'll come more and more closer to us even though we might not see or believe it. It is my humble prayer that we continue to cultivate a strong and even closer relationship with Bhagavan Sri Skanda and in so doing, I strongly believe He will help us live a happy and full life filled with Sri Skanda's love, guidance, and protection. After I returned home, from abroad for my studies, I visited our local Thiruchendur Murugan temple. I was captivated by the beauty of the murthi of our ever-bountiful Lord and was reminded of the vision I had in January 7, 2004 (read the above experience). One thing that I noticed immediately was that the Vel that Skanda was holding in the vision was a GOLD one. When I had this experience in Jan. 7, I contemplated to myself at which temple it was that this experience took place. I thought it was our local Murugan temple since the murthi was very identical to the dream, but I wasn't certain because the Vel the Murugan murthi had in our local temple was a SILVER one. Above is the picture of Murugan and His Vel at the time of the maha-kumba-abishekam, on February 4, 2004. Note the SILVER Vel. But in the Jan. 7, 2004 dream (see above experience) recall that the Vel Murugan was holding was made out of shining GOLD! So, when I came from abroad in April 21, 2004, to visit the temple, I noted that the Vel Murugan had was indeed made out of GOLD! 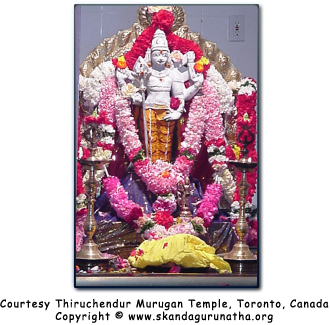 The figure on your right is the picture of Murugan and His Vel as He appears now, on April 21, 2004. I asked my mother (who is a frequent and regular temple goer), "Amma before I left for my studies, didn't Murugan have a silver Vel?" My mother replied,"Yes He did. But recently (sometime in April), a devotee took it upon herself to emblazon the silver Vel with gold. This is why you see a Murugan with a GOLDen Vel." It then readily became apparent to me that the dream I had was indeed in the Thiruchendur Murugan temple! Moreover, Lord Murugan showed also in this dream/vision (way back in Jan. 7) that He was about to receive a GOLDen Vel and that He is in fact alive! I later met the devotee who had performed the wonderful seva (service) to the Lord by voluntarily making the GOLD Vel and I told Her about the dream I had. She became very emotional and cried happy tears knowing that Lord Murugan lovingly accepted her devotion and service. I, too, cried because Lord Murugan decided to use me as His instrument to convey this experience to His beloved devotee. 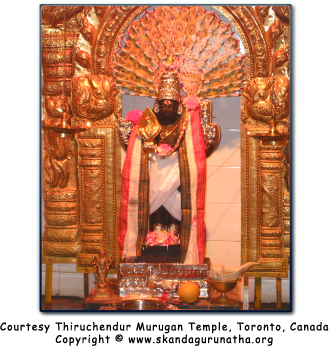 The figure above is a picture of the mulasthaanam at the Thiruchendur Murugan Temple. A devotee is on your left...this is where I was standing in my dream and my wife was standing on the right, however, we were both a little behind the myol (peacock) vahana, not in front of it. What more can I say other than I pray that we all learn to grasp how loving Lord Murugan is; how powerful His sacred mantra is; and how alive the temples are in which He resides. Yesterday I had a wonderful dream (as usual) of Lord Murugan. The day before (July 31) was powrnami (full moon) and I had gone to the house of a devotee of Sri Narayani Amma. The family is a disciple of Sri Narayani Amma and performs full-moon pujas regularly for their SatGuru. I arrived a little late due to some errands that I was forced to do but, nevertheless, I still managed to partake in the yagna as it was in progress. The devotees were singing bhajans, but for some reason I did not participate. Instead, I heard a little voice inside of me chanting Sri Skanda's Mantra. As I stood still and continued to pay attention to the inner repetition of this mantra, the sound levels of the bhajans and singing attenuated and the inner voice within me became louder. I became self-absorbed listening to it and forgot the devotees and the surroundings. Inside myself, I noted the subtle vibrations of the mantra and a sphere of serenity that I was able to transcend and bathe myself in. It was so quiet even though the devotees around me were probably singing loudly. I didn't notice just how loud the bhajans were until I reemerged from within myself. The yagna concluded with the singing of a Thiruppugal song  which I sang along with the devotees. The remainder of the puja progressed nicely and the evening came to an end. That night, I had a nice vision. I saw myself in the vision standing in front of an altar. There was a bright golden light coming from within the altar and it shone outwards and touched my face. I was wearing a veshti and was continuing to chant Sri Skanda's Mantra. I looked at the altar and to the delight of my eyes, was a big, tall brightly shining Vel. It had a golden aura that beautifully formed the contour and shape of the sacred talisman of Lord Murugan. One thing that I did notice was the same serenity and peace I felt when I chanted Sri Skanda's sacred mantra during the full-moon puja at the devotees home yesterday. I awoke realizing at once what a powerful mantra Sri Skanda's Mantra really is.